Visitez l'abbaye de Santa María de Montserrat lors de cette visite privée de Montserrat. 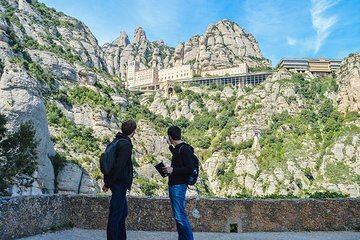 Vous voyagerez avec un guide personnel en train depuis Barcelone, puis monterez en train à crémaillère ou en téléphérique jusqu'au monastère bénédictin situé au sommet de la montagne. Écoutez les voix enthousiastes de L’Escolania de Montserrat, célèbre chorale de garçons, et admirez la célèbre Vierge noire (La Moreneta). La prise en charge à l'hôtel est incluse dans cette visite de 7 heures, avec dépose à la Plaza de España à Barcelone. Mark our guide was terrific. It was great having him meet us at our hotel and guide us the entire day. Not a thing to worry about and hes a wealth of information. We enjoyed a tapas lunch to top off a great day. Our guide was charming but didn't know much about where we were going. The lunch offered was a buffet and not so good. The views were magnificent! We started off from Plaza Catalunya up to the start of the cable car. Perfect travel time to discuss much more about the tour and the important facts of Montserrat. We had a chance to absorb much of the details because we were only 4 in this private tour and we had time to enjoy photo shoots and prayer and a lovely paella meal. Without having to rush. Marc is our tour guide in La Sagrada Familia and here so we're comfortable being with him. As nice as always and being so patient with us on our request even to go uphill. The best! Great tour to Montserrat. Ramon was very helpful in making sure our day was filled interesting information and the sites of Montserrat. We loved this tour! We were met by Marc who made our traveling day hassle free and a pleasure. He was kind and patient, very attentive to all of our needs. He had so much information and history to share with us. We were a family of 6 so he kept us moving but at a perfect pace. It was such a pleasure to have him guide us throughout the day. We finished our day with a lovely Paella lunch at a terrific restaurant. He was very in tune with our expectations and we loved every minute! Jordi met us at our hotel promptly and began what turned out to be an incredible day! Jordi knew all of the tips and hints for the transit systems that took us to Montserrat. Without his guidance, we would have been left in the dust! As it was, we were in the front of the gondola that took us up the mountainside to the town of Montserrat and had the best views! He was very knowledgeable about the history and he made sure we had the shortest wait to see the Black Madonna and make our wish. He also guided us in the church to witness the amazing performance of the boys choir. Afterward, Jordi took us back into the city for a fantastic lunch. It was an unforgettable day made perfect by our guide Jordi! I busy day but our guide Jorge was professional and personable and kept us moving and informed. A wonderful way to see Montserrat and sample some of the local food and culture. Our tour ended with a lovely paella dinner at a Barcelona restaurant. A most enjoyable day.